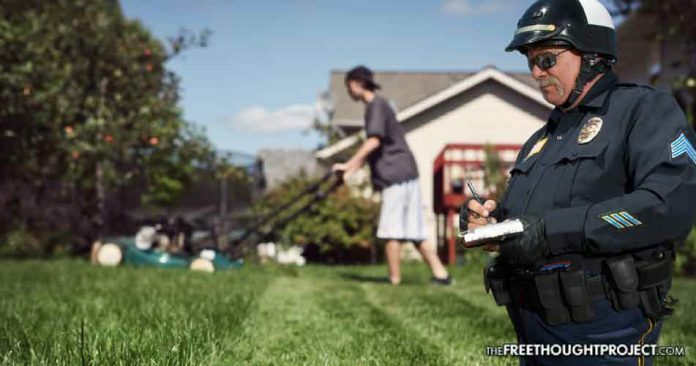 In the Land of the Free, it is now illegal to mow grass from extra money during the summer time, unless you pay the right state official for the privilege of working. These permit requirements are ultimately enforced through the power of police and fines. It’s patently absurd that local teenagers can’t make a private agreement with a neighbor to mow a lawn without the government sanctioning the transaction by inserting themselves as the arbiter of who is allowed to legitimately cut grass. Mowing grass in the summer is often one of the first jobs a motivated teenager will engage in during their summer break from school. But, with a business license costing $110 for a job that will likely be ongoing for a few short months in the summer, the cost will likely drive many ambitious entrepreneurial teens away from what would likely be a rewarding experience. “I have never heard of a child cutting grass having to have a business license,” Elton Campbell, whose granddaughter, Alainna Parris, mows a few lawns around the neighborhood, told ABC-33/40. “She charges one lady $20, and another lady $30, and another girl $40 besides what we pay her,” said Campbell. The teen is disappointed as she felt like this was the perfect way for her to make some extra money during the summer. “Just helping out and raising money for admissions and trips,” said Alainna Parris. According to Campbell, Parris is allegedly being targeted by someone upset by the competition from the teen. That person is using the power of the state to eliminate his competition. “One of the men that cuts several yards made a remark to one of our neighbors, ‘that if he saw her cutting grass again that he was going to call Gardendale because she didn’t have a business license,'” said Campbell. Campbell called out the irony of trying to prevent a child from taking on a summer job, when they show an internal drive and take the initiative, as so many teenagers are not engaging in enterprising behavior, or taking on additional responsibilities, during their summer break. “He’s coming after a kid when a kid is at least trying to do work. There’s kids at home on iPads and electronics and not wanting to go outside,” said Parris. Hogeland stated he’s committed to finding a way to resolve this issue. But, of course, the government still wants its cut, so he will explore the possibility of a temporary license for summer months that targets entrepreneurial youth. While it is heartening to hear Mayor Hogel recognize that it’s unfortunate there are young people are complaining about the permits for cutting their neighbors grass for a few bucks and saying that he doesn’t want this to discourage kids from trying to earn money, the fact that he still believes that these kids should be licensed, speaks to the true insanity of government over regulation. There is clear cognitive dissonance seen in Hogel’s ablity to recognize the foolish and petty nature of calling city authorities on these teenagers for trying to do something adults should be congratulating and supporting while at the same time failing to acknowledge that there is no legitimate reason for these kids to be licensed. The formality of requiring teens to be licensed to cut grass is a simple revenue generation scheme, plain and simple. This type of regulation does nothing to keep anyone safe – and only serves to enrich the government coffers. Once again the free market is being squeezed by unnecessary regulation, for the sake of revenue generation, which only serves to stifle competition and keep consumer prices higher.